Every year, roughly 100,000 people around the world die from a venomous snake bite. Depending on the toxicity of the venom and how much venom is injected into the body, a snakebite will cause tingling, muscle weakness, nausea, swallowing difficulties, excess saliva, and potentially fatal breathing problems. To avoid death, a snakebite victim must immediately go to a hospital for antivenom treatment. If the patient arrives in due time — and if the hospital has the corresponding antivenom in stock — there’s an almost 100% chance of survival. As you might have guessed, the reason why so many people die from venomous snake bites is that even if a hospital is nearby, there often isn’t enough antivenom to spare. In this post, you’ll learn how antivenom is made, the challenges to antivenom production, and why antivenom is so precious. It’s amazing to find out that antivenom was first introduced only 100 years ago — until then, people could only rely on their own immune system to survive, which frequently didn’t cut it. Albert Calmette, a protege of the famous Louis Pasteur, made the first antivenom serum in 1896 in present-day Vietnam after a flood forced monocled cobras into a village near Saigon, where they bit at least 40 people and killed 4. A man of science, Calmette wasn’t satisfied with hope alone to save those unfortunate enough to get bitten, so taking inspiration from the then-innovative vaccination wave, he made it his mission to create antivenom. He eventually discovered a process by which horses could be injected with venom to produce antibodies. He then extracted blood from those horses and injected it into the snake-bitten victim. Today, although techniques have improved over the century, the process remains more or less the same. In a typical antivenom institute, various species of snakes are bred, cared for, and constantly monitored to ensure they are in good health. When the time is ripe, professionals introduce the snakes (which can include some of the deadliest, like banded kraits or black mambas) into a milking room. The snake is grabbed with the thumb and index finger at the very back of the head just behind the angle of the jaw where the venom glands reside. This allows the snake milker to press the snake’s glands without allowing the snake to turn and bite — even so, many professional snake handlers are bitten hundreds of times during their career. The quantity of venom even seasoned professionals can milk is very small, so the snakes have to be milked many, many times to produce a useful amount. For instance, it took a total of three years and 69,000 milkings to produce a single pint of coral snake venom. Once milked, the venom must be cooled to below -20℃ and is then typically freeze-dried for easier storage and transport. This process also concentrates the venom by removing water. Of course, each vial of venom needs to be correctly labeled with the snake’s species, geographical position and so on. Then comes the immunization part. Traditionally, horses are used to create antibodies because they thrive in many environments worldwide, have a large body mass, get along with each other and are familiar enough with humans that they aren’t easily scared by the injection process. Goats and sheep are also used, as well as donkeys, rabbits, cats, chickens, camels, and rodents. Some institutes even experiment with sharks. The antivenom produced from sharks is quite effective, but they’re rarely used for obvious reasons. Before injecting the animal, chemists carefully measure the venom and mix it with distilled water or some other buffer solution. Most importantly, an adjuvant is added to the solution so that the horse’s immune system reacts and produces antibodies that bind to and neutralize the venom. A veterinarian supervises the process at all times so that the horse (or another animal of choice) remains in a healthy condition. Antibodies in the horse’s bloodstream usually peak in about 8-10 weeks. At this point, the horse is ready to have its blood harvested — typically 3 to 6 liters of blood is drained from the jugular vein. The next step in the antivenom fabrication process is purification. 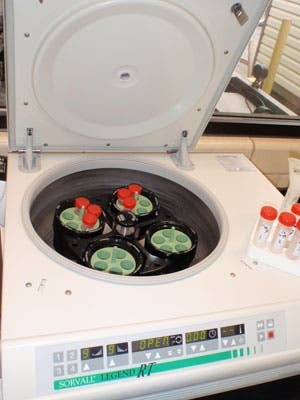 The blood is then centrifuged to filter the plasma — the liquid portion of blood that doesn’t contain blood cells — to allow separation of the antivenom. During this step, producers typically employ their own methods, many of which are kept a trade secret. However, typically, unwanted proteins are discarded through precipitation by either adjusting the plasma’s pH or adding salts to the solution. One of the last steps in antivenom preparation involves using an enzyme to break down the antibodies and isolate the active ingredients. The last step is usually checked by an outside regulatory body like the FDA in the United States. Once approved, the samples are concentrated in powder or liquid form, then frozen and shipped to hospitals where they’re most needed. As you can see, the process is extremely complicated, expensive, and of little yield. 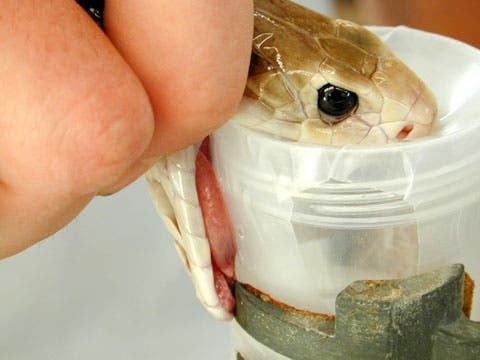 For instance, a typical antivenom vial costs $1,500 to $2,200, but a snakebite requires between 20 and 25 vials to be neutralized. If you add these up, a man bitten in the US by a venomous snake would have to pay $30,000 in pharmacy costs alone. Yet most snake bites occur in developing countries, especially in rural areas of the tropics. Because the costs and energy required to produce antivenom are so large, producers don’t make enough to provide to these areas because it’s not financially feasible, despite high demand for the product. As such, even if these individuals make it to a hospital for treatment, antivenom is in little or no supply. Antivenom isn’t the only way to survive a highly venomous snakebite. An alternate route, which is only feasible for those that are constantly exposed to the risk of being bitten by venomous snakes, is to build tolerance — after all, humans have been intentionally exposing themselves to poisons for millennia. The first account of such practice may be found in the story of king Mithridates, the ruler of Pontus (a region of in Asia Minor). Mithridates was openly opposed to the Romans, and in those times, the weapon of choice for assassinating the upper class was poison. Paranoid about getting killed after every morsel of food, Mithridates eventually became a veritable scientist and poison control expert. The details are sketchy and have been lost in time — some say he poisoned ducks, then drank of those who survived. Nevertheless, we know that he discovered that by gradually exposing himself to a nonlethal dose of poison (say, arsenic) he would eventually build up immunity — up to a point. Ironically, he killed himself by ingesting an immense amount of poison after suffering a decisive defeat at the hands of the Romans. The practice is now commonly known as mithridatism, which also works for snake venom. 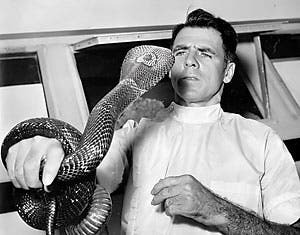 Bill Haast, a famous snake handler who died at age 100, was known for milking up to 100 snakes a day. You can imagine that, at this rate, he would get bitten often. Realizing this, in 1948 he began injecting himself with increasing doses of diluted cobra venom in order to develop his own immune resistance. By the time he died — of natural causes, we should add — Haast had survived 172 bites from many of the world’s deadliest snakes, including a blue krait, a king cobra, and a Pakistani pit viper. He even flew around the world and donated his blood for direct transfusion, thus saving 21 victims.